There Is A God...So, You Never Know. Yep, there I am in Paris. 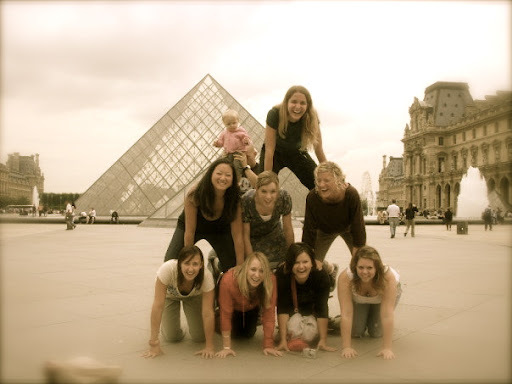 I'm the one in the middle of the human pyramid. That baby is my eldest when she was 10 months old. Here is what brings this post about. Tonight at dinner Jady and I were talking about how we are 30 and we are in the middle of this great adventure where anything could happen at any moment. After dinner we were watching this video on Martin Smith & Delirious. They were this little nobody band who used to just play in schools. Then they got an invited to play at a prayer conference & God launched them into being a massively influential band. Fast forward a few hours...I was watching a Hillsong promo for a conference (shocker) and one of the guys said " I don't think I can make it, but there is a God so, you never know." There is a God...so, you never know. He may surprise you.